Sage, also called Garden sage and Kitchen sage is native to southern Europe and the Mediterranean region. It has long, oval grayish leaves covered with bumps and blue to purple flowers that are decorative and comestible as well. Plant the sage in full sun 24 inch (61cm) apart. Grows to 24 inch (61 cm) tall. It blooms in June. If you want to have your sage to come back every year, plant the Salvia Officianalis variety. Sage helps to keep white butterflies away from cabbage and bugs from carrots. 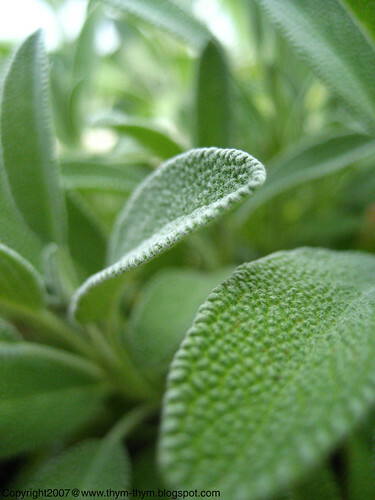 Sage is known to have a slightly peppery and bitter taste. It has to be used in small amount as a little goes a long way. It is used as seasoning for cheese, vinegars, Veal, fish, sausage, stuffing, soups, and sauces. It is also used in Italian cuisine like Piccata, Saltimbocca, Rice Minestrone and Italian Vermouth. I like it in my salads and my caramelized baby carrots. The Latin name for Sage is “salvia” which means to heal. Sage is believed for centuries to be a medicinal herb for Stomachache, cold, sore throat, gas, anxiety, excessive perspiration, and has been shown to boost memory. But don’t take too much of it as it is toxic in excess or over long periods. Gather the sage in a bouquet but without their flowers. Hang upside down and place them in a dark, dry and well-ventilated room for two to three weeks. To keep them from the dust cover them with a paper bag with holes on it. But do not use plastic bags. Keep your dried sage in paper bag, tightly closed. Next week, I will show you how I used sage in a twist to an Old Italian recipe. Until then, have a good weekend my friends. That is a BEAUTIFUL picture and I may want to get a high quality copy from you to have printed out and hang on my kitchen wall. I love Sage. sage butter, in stuffing, with chicken and to smudge the house. Dear Rose, this post came at the perfect time. I don't have any sage in my garden, so I had to purchase some to put in the caramelised carrots as you suggested. I have a lot of sage now, so the storage sugegstion is great. Thank you for this and also for all your tips about my menu. I have three different sage plants growing in the garden and they each seem to come back better with the passing years! The one you picture is fabulous but the one I most enjoy looking at is the hazy purple one. Sage was always my mom's favorite. that is a real good macro of the sage.I'd love to grow some sage in my garden.But dont know if it grows in warm climate.Nice article. I've got some sage growing in my garden but haven't been using it much in the summer months. Find it so over powering I only use it in stews and such like. Interested in the carrot and salad idea. Will try it out. Thanks! Love that photo - I can even feel the fuzzies on the leaf! I enjoyed sage this week as an accompaniment for meaty ravioli, cooked in butter until crisp with pancetta and finished with plenty of parmesan. This is one recipe in which it's OK to be a little less conservative with the sage! - Thank you very much Shayne. I hope you will enjoy it in your kitchen. - Nora, I hope you will enjoy it with your carrots. I can't wait to hear how your july christmas went. It was all my pleasure my friend. - You are very lucky Tanna. It is good to know that they all come back year after year. I guess, I was wrong. The next sage that I have to get now is purple sage. - Thank you very much Kate.Nice to see you again. - Merci beaucoup Hilda. Je suis contente que cela te plaise. - Wendy, sage is indeed over powering sometimes. That's why you should only use it in small amount. - That's so funny Rosa, because that's what I was planning to do with my sage. But just not sure what to use for the ravioli stuffing!! Thanks again for your nice comments. What a stunning photo. I love sage and have been meaning to start growing my own so this was a wonderful post to read. - Thank you very much Truffle. Sage is indeed a great herb to plant and eat too.